The Young and the Restless Spoilers: Victoria Wants Billy Back! The Young and the Restless Spoilers, Wednesday, April 19th: Victoria Wants Billy Back! 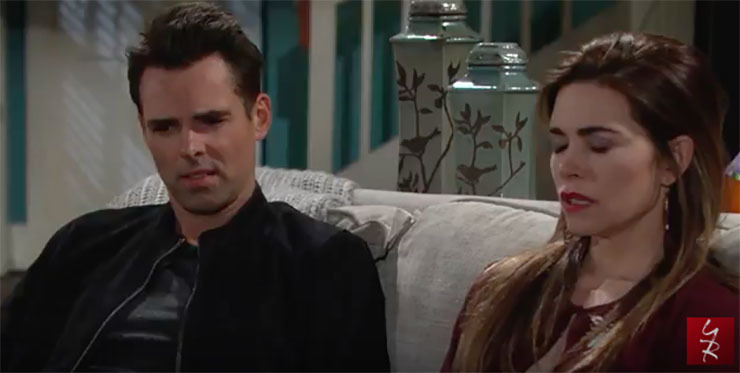 Even Billy seems confused by Victoria’s desire in The Young and the Restless spoilers. The Young and the Restless spoilers for Wednesday, April 19th, predict that Victoria makes a shocking, yet familiar, pronouncement! That’s what Nikki (Melody Thomas Scott) asks her daughter, Victoria (Amelia Heinle) Wednesday. She’s talking about a reunion of Villy–Victoria and Billy (Jason Thompson). Victoria says, “Yes, I want Billy back.” Several phrases come to mind, including, “glutton for punishment!” Also, codependent much? Little does Victoria know the creepiest couple in recent Genoa City history, Billy and Phyllis (Gina Tognoni) is doing the vertical tango as she says these words to her mom! Really, Billy and Phyllis, you’re not about to win any soap supercouple awards. You two need to move on! Or maybe they don’t. Who are we to say? What do you think, dear Soap Cities readers? Devon (Bryton James) and Neil (Kristoff St. John) make a pact. Hopefully it won’t have anything to do with being in love with the same woman! Meanwhile, Devon’s new love interest, Mariah (Camryn Grimes) goes to the movies with Kevin (Greg Rikaart). Who’s at the same theater and same movie at the same time? Sharon (Sharon Case) and Scott (Daniel Hall)! Just as Sharon shoves a handful of popcorn in her mouth, as many of us do with that yummy treat, Mariah sees Sharon and calls out her name. Busted! Sharon turns around in shock. Kevin recognizes Scott and calls out his name too. Ever heard of keeping your voices down in a movie theater, you two? Previous ArticleDays of Our Lives Spoilers, Wednesday, April 19th: Kayla Unmasks Jade!